Signal to noise ratio of 18% gray luminosity and color temperature 2900°K (halogen tungsten). Using manufacturer ISO stops 100, 200, 400, 800, 1600, 3200, 6400, 12800. 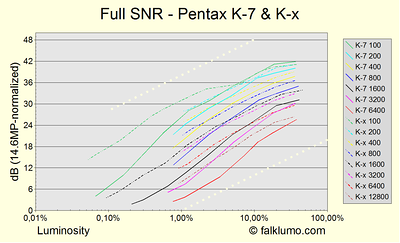 The interpretation of results is the same as for the corresponding graphs on dxomark.com. E.g., print-normalization is for 8 megapixels. The dotted lines indicate the slope for pure photon shot noise. Obviously, the K-x has no true ISO 100 and both cameras reduce noise even in RAW at ISO 3200 and higher. The ISO sensitivity of the K-x seems to be slightly higher, like at ISO100, true ISO were more like 87 for the K-7 (DxO's value for the K20D) and 105 for the K-x. However, the above curves have not been left/right-shifted to take this into account. 150 noise sample patches. Shot with the Pentax K-7 and Pentax K-x camera at identical lighting and manual exposure settings. The color temperature is 2900°K (tungsten) rather than 5600°K (daylight)! Developed from RAW (DNG) using Lightroom 2.4 and all parameters set to zero (this is different from the default setting!). 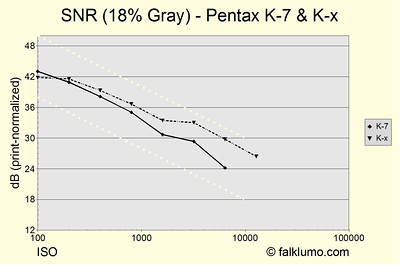 The K-7 was slightly downsampled to match the K-x fewer pixel count.